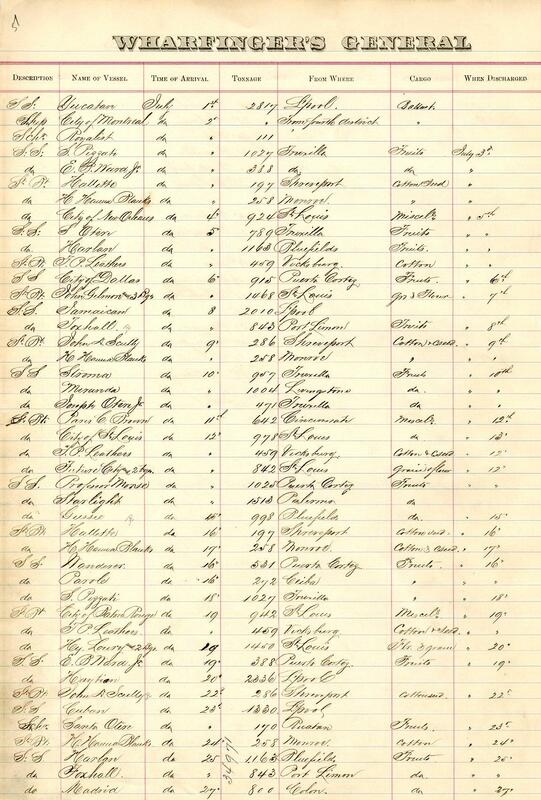 Attached file of a sample page from the July, 1888 New Orleans "WHARFINGER'S GENERAL VESSEL and CARGO BOOK" which was bound into a large ledger kept by the wharf keeper to keep track of the comings and goings of boats and ships that carried freight to and/or from the Port of New Orleans. Usage fees must have been charged to the vessels by the wharf keeper as well. Pages measure 11.20 x 17.70 inches. As you can see the majority of the vessels were from foreign ports while the river steamboats were far fewer by comparison. I was able to locate photos of some but not all of the steamboats and in photo shop added the boat's name, month and year. Home port circa 1881, New Orleans, Louisiana. Original price $84,300. When new and on a delivery trip, she got stuck on the rocks at Louisville Falls and remained three weeks. Ran St. Louis-New Orleans. while he was preparing to expand his OLD TIMES ON THE MISSISSIPPI magazine articles into a full length book which would be entitled LIFE ON THE MISSISSIPPI. Clemens traveled on five different boats during his voyage from New Orleans to St. Paul. 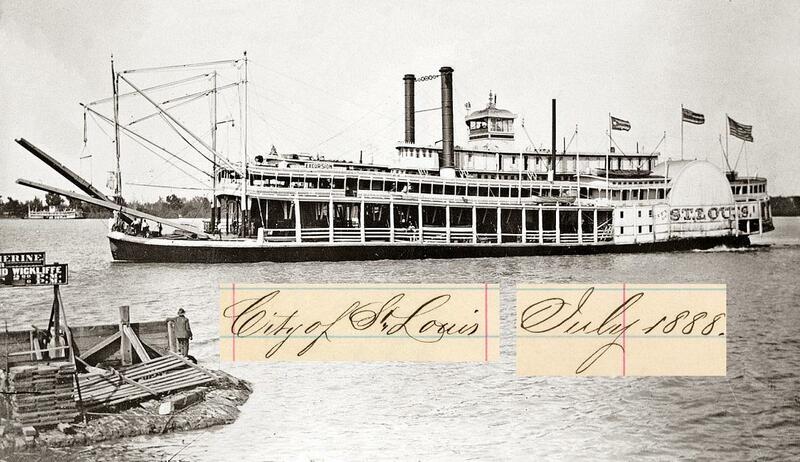 He was a passenger aboard the CITY of BATON ROUGE from the sixth through the twelfth of May, 1882. The pilot was Horace Bixby who had "learned" Sam the river from 1855 to 1859 to qualify him to obtain his pilot's license. May 8, 1882—Got up at 4 A.M. in a roasting-room—some idiot had closed the transoms & I was over the boilers— & went on watch. Fog—Geo. Ritchie steered the watch out by compass, using his & Bixby's patented chart for the crossings & occasionally blowing the whistle. The chart is a great thing—many pilots use it, now. Her engines came from the first GOLDEN RULE. 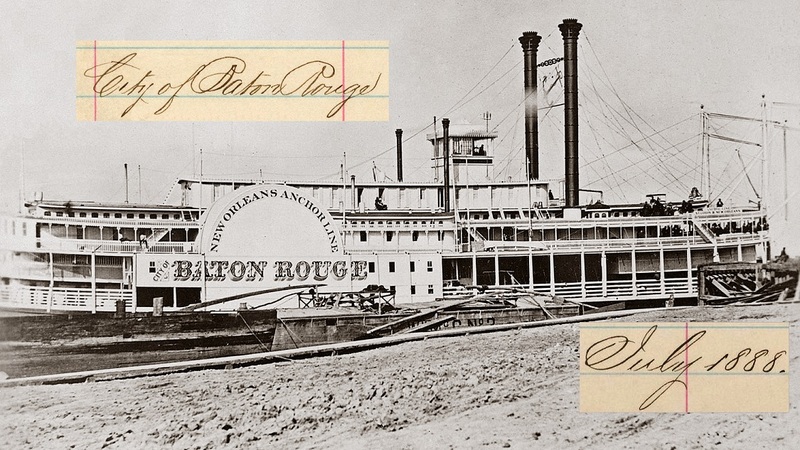 In the fall of 1878, she came out in the Cincinnati-New Orleans trade. 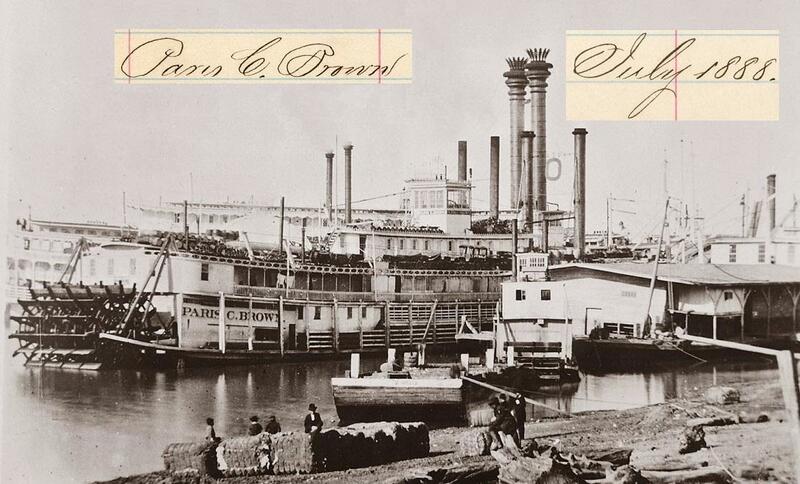 She was named after a Paris C. Brown who was connected with the Marine Railway Company and also with the boat store Parker, Wise and Company. Ran on the Ohio and Mississippi rivers. OTHER INFORMATION: Ways - 5286; T.P. 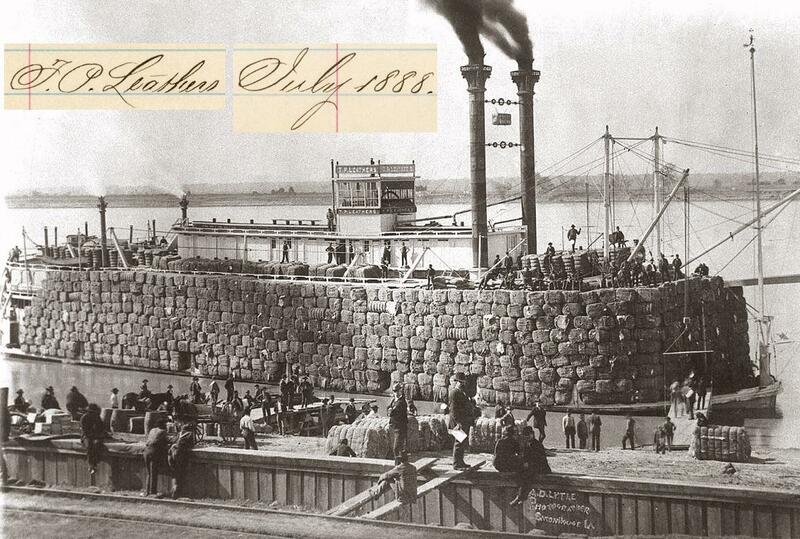 Leathers was a large cotton carrier in the Vicksburg-New Orleans trade. 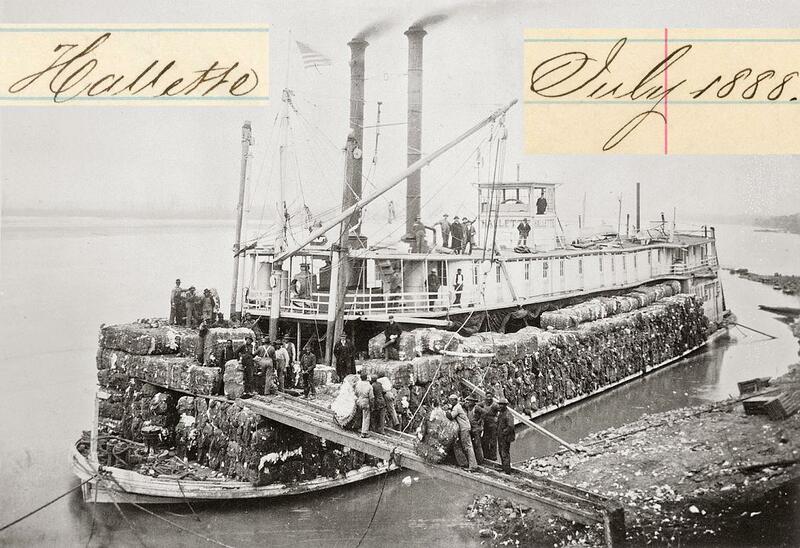 When she sank about three miles above Natchez in November, 1890 she was loaded down past dry seams with 1700 bales of cotton and 8757 sacks of cotton seed. The T.P. LEATHERS was named for Captain Tom P. Leathers who was born in New Orleans on May 24, 1816, died June 13, 1896. The GENERAL QUITMAN in partnership with John W. Cannon, the NATCHEZ (1853-February 1854), the NATCHEZ (1860-March 1863), T.P. LEATHERS (1891). In partnership with Captain Truman C. Holmes, Leathers owned: the PRINCESS, the C.C. JUNIOR, the R.W. McREA and the CAPITOL. In the winter of 1868 he was captain on the BELLE LEE. A fight regarding the terms of the charter of the BELLE LEE ensued between Captain Leathers and Captain John W. Cannon and from that point on Leathers was regarded as an enemy by Captain Cannon. Leathers held stock in the packet MAGENTA at various times. He was captain of the NATCHEZ when she raced the ROB'T E. LEE in June-July of 1870. Built in 1887 at Jeffersonville, Indiana at Howard Ship Yards Original price, $11,500.197 tons.Her machinery came from the ALEXANDRIA. She was named for the daughter of H.C. Stringfellow, a Shreveport plantation owner. Home port/owner's residence of the Red River Line circa 1887 was New Orleans. 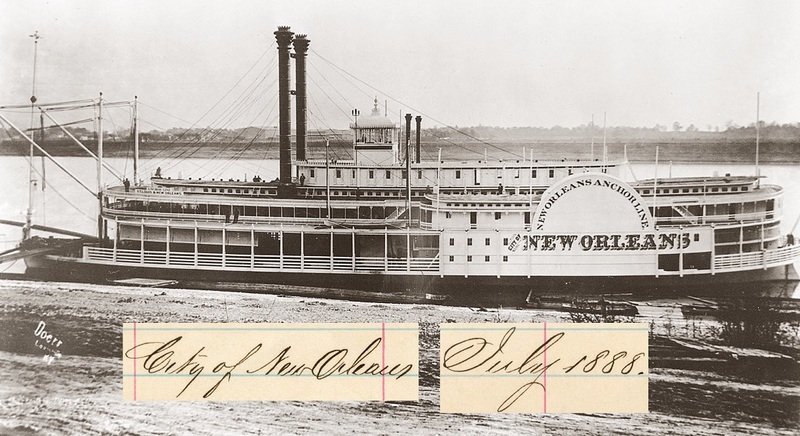 In 1902 she ran the New Orleans-Atchafalaya-Des Glaizes trade commanded by Captain E.A. Rucker with Oscar Smith, clerk in place of the steamer JULIAN POYDRAS. In 1905 she brought cotton out of the Yazoo for the Parisot Line. No further history of the HALLETTE has been found. "Hey." was an abbreviation for Henry and "Loury" was evidently a misspelling of Lourey. 209.6 x 35.2 x 5.8. Engines 26's - 9 foot stroke. Built in 1881 at Mound City, Illinois by the St. Louis & New Orleans Transportation Co. and absorbed into the St. Louis & Mississippi Valley Transportation Co. ("Dog Catcher Line", so termed by rivermen for the reputed vocation of employees during layup) in 1886. Henry Lourey, Vice President, died in St. Louis on March 2nd 1885. Capt. George W. Woodward was master in 1896. She was sold to the Combine in November, 1904 along with 34 model barges and towboats H. M. HOXIE and S. H. H. CLARK. She then towed coal south from the Ohio River to New Orleans until dismantled at Elizabeth, PA in June, 1911. The hull was burned to recover old iron two years later. In 1920 the old bones of the hull were still imbedded in the mud opposite the Elizabeth Marine Ways. The photo is the "right eye" of a Keystone stereoview from my collection Number V1450. 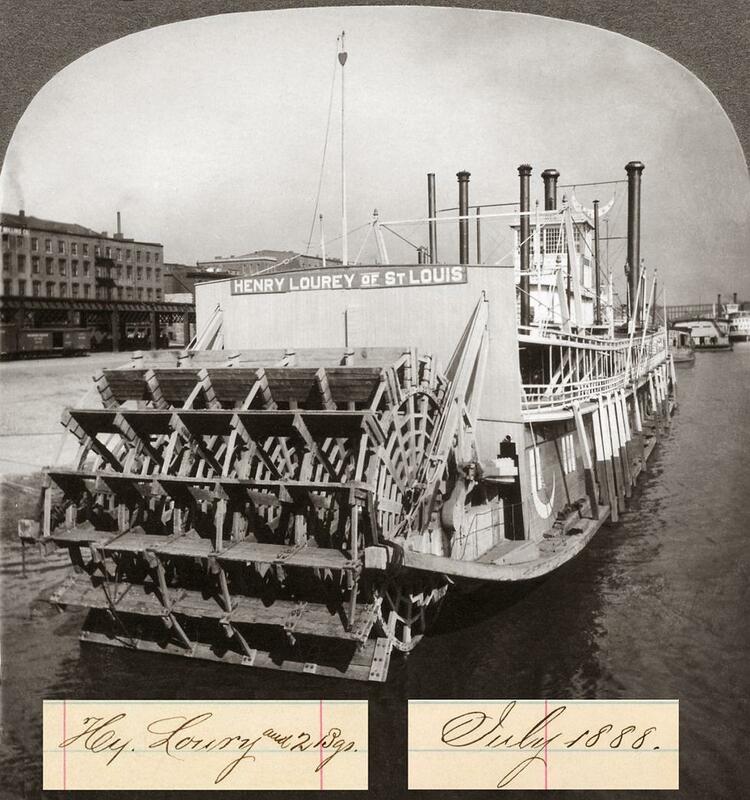 According to rootsweb.com the stereoview of the Steamer HENRY LOUREY was taken prior to her being sold to the Pittsburgh Combine in 1904 from St. Louis.